Discussion in 'Digital & Modeling Gear' started by RLD, Apr 27, 2016. Elric, Ken, Willowdale and 7 others like this. The Helix is more frigging awesomer! The Axe FX 2 is more frigging awesomer! The Helix features are even more awesomer then the Ax8! A USB audio interface is superior and useful! A discount on the Helix is super bad a$$! 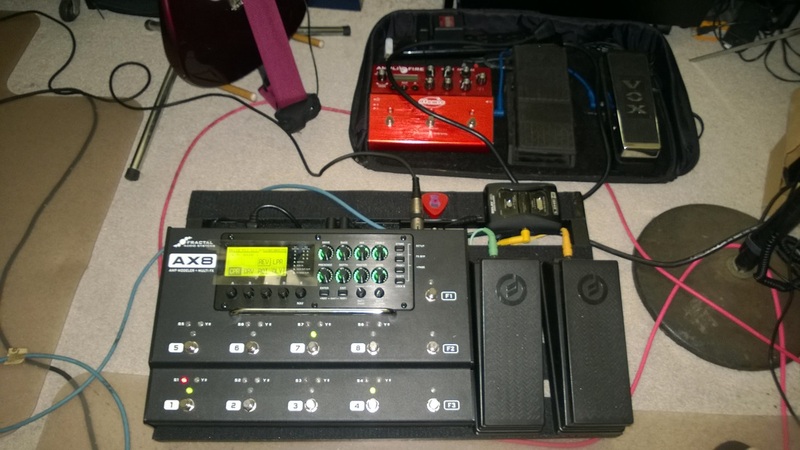 A used Axe Fx 2 Mark 2 that is the slightly more then a AX8 is even more superior and awesomer! I've had the Helix since last November. Got the AX8 yesterday late afternoon. Can't keep both. The Helix is on the Austin Craigslist. Both are excellent, but there is something about the Fractal that resonates with my preferred tone right out of the box. Willowdale, stratchamp57 and scook like this. Dammit, you plagiarized my review! Just wait till they port over the Quantum version 3.0. It's a legitimate paradigm shift. I played about three hours with it on the Axe today for the first time and was blown away. Willowdale, dray3573 and scook like this. That's what they said about Quantum and Quantum 2... It better blow my doors off when they release it for AX8... AX8's Human interface is already on my S**t list. I definitely think that Fractal has continually made incremental improvements, and that Quantum firmware versions 1 and 2 were a good step up. Some of the amp models and characteristics I was on the fence about before have arrived now as far as I'm concerned. Over on the Fractal forum people are finding success using a cheap Tablet running Windows 10 to run ax8 edit. It's not something I see myself needing all that much but for maybe 60-70$ bucks it'll connect via USB and make editing at a gig much easier for those of us that are still learning the interface. And then you will also have a device that can be used for other stuff, like playing games while your waiting for the drummer to show up. I just updated to Quantum 3.01 on my Axe Fx 2. I'm not really hearing any difference. Is there a reset you have to do? Depends on how you're set up. Go into Global on the front panel of the Axe and make sure Default Modeling Version is set to Latest. Update Axe-edit and refresh the block definitions and everything should be current as far as I know-- I'm still pretty much a noobie. In the preamp section someone can currently switch between the Latest and versions 2.04, 2.01, and 2.0 if they're inclined. 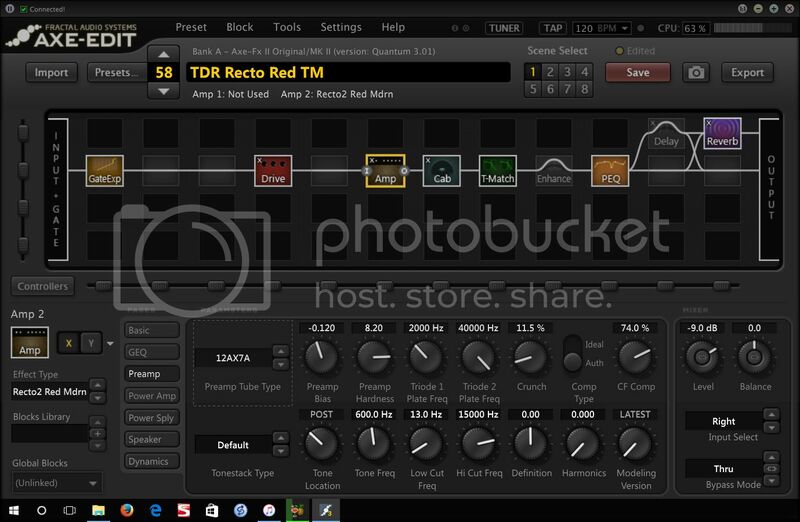 Also in March this year Fractal updated the factory presets in the download section. I've only plugged my Strat in today, and so far with single coils it shows. Thanks for the advice on the front panel. I never touch that so that might be the issue. I have done all the rest though. You're welcome. Better not blink because they just fixed a bug and current firmware is version 3.02. One more download and refresh and you're good to go. Better not blink because they just fixed a bug and current firmware is version 3.02. Now this is one of the things that can be frustrating and great about Fractal. I wish they would release a final version with all the bugs worked out but its great they fix the bugs so fast. Even the betas are really stable. It's usually just little kinks in these type of quick fixes, and yes they are very responsive.